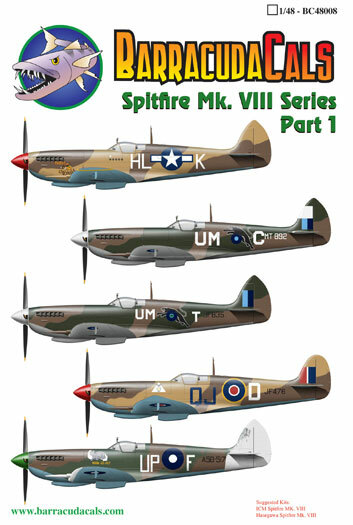 The 32nd scale sheet is, of course, timed to coincide with the release of the gorgeous new Spitfire Mk VIII kit from Tamiya. This sheet is packed with 5 unique and different subjects. Some have been seen before on decal sheets, but have never been depicted correctly, where as the others are new and have never been done in decal form before. One US option, one Australian option, and 3 RAF options round out the sheet. The 1/48th sheet is similar, although there is a sixth option added in, and will work with just about any Spit IX kit available in the scale. The decals are at the printer as we speak, and they will be debuted at the IPMS National convention in Phoenix in less than a month. along with all the new 1/32 resin Spitfire detail sets from BarracudaCast, you will be able to really make your Spitfire stand out from the crowd. More Spitfire sets are in the works as well. Pre-orders are not being accepted yet, but will begin when I get a hard delivery date for the new sets. Watch theBarracudaCals website for announcements and details. I am really excited about these new sheets, as the schemes are varied and exciting. I hope you are, too!